Value investing got even better in 2000. While an Accounting Professor at the University of Chicago, Joseph Piotroski published a research paper - Value Investing: The Use of Historical Financial Information to Separate Winners from Losers. The study identified nine factors available in a company’s financial report that affected the performance of Price/Book (P/B) value investing. These 9 factors became known as the Piotroski Score. NOTE: If you are able to get a copy of the study, Piotroski uses Book-to-Market, the inverse of Price to Book. In the study, higher is better. Price to Book (the price per share divided by the book value per share) is a common starting point for a value investing strategy and is an alternative to PE, Price to Sales and Dividend Yield. Like PE and Price to Sales, lower is better from a performance expectation standpoint. The underlying rationale of value (or contrarian) investing is that many of the stocks with the lowest “value” do not really deserve to be there and are actually far more valuable than perceived by investors. Of course, many of these stocks deserve to be there and are on the road to bankruptcy. Piotroski identified a way to separate the sheep from the goats. There have been a number of studies showing that the lowest quintile (20%) of stocks in any of the primary value categories will outperform the top quintile – i.e., value outperforms growth. Normally performance drops off as you rise through the quintile groups. The typical holding period of the studies is 1 year or longer. One of the issues is that very few can afford to buy the entire quintile. The bottom 20% of the S&P 500 would still be 100 stocks. Other studies have used tenths rather than quintiles. In order for the study to be meaningful, the universe of candidate stocks must be large enough. Piotroski used data from the Comstat database for the years 1976 through 1996 so OTC stocks were not included in the study. For each test, the stocks were divided into 5 groups based on their P/B ratio. The study did not propose a large set of possible measures and then select the best-performing. The 9 signals were identified prior to the study and before the results were known. The study concluded that low P/B stocks with a high Piotroski Score were likely to outperform. Similar stocks (those in the same quintile) with a low score were more likely to do poorly, or worse, to go out of business. Stocks in the outperforming group with little analyst coverage were considered best. Small and medium market cap stocks outperformed the larger cap stocks in the low PB group. Piotroski attributed some of this to the amount of analyst coverage. Overall, out-performance was about 7.5% over the length of the study. So, he did not just pick 9 signals, he picked signals based on research published by academic peers (French, Famy, Lakonishok, etc). For example, Sloan published research in 1996 showing that net income exceeding operating cash flow was a bad signal about future profitability and returns. This was incorporated as Signal 4. For stock screeners with sufficient data, implementing these signals may lead to performance improvements in value investing strategies. Check our investing glossary for definitions of these terms. 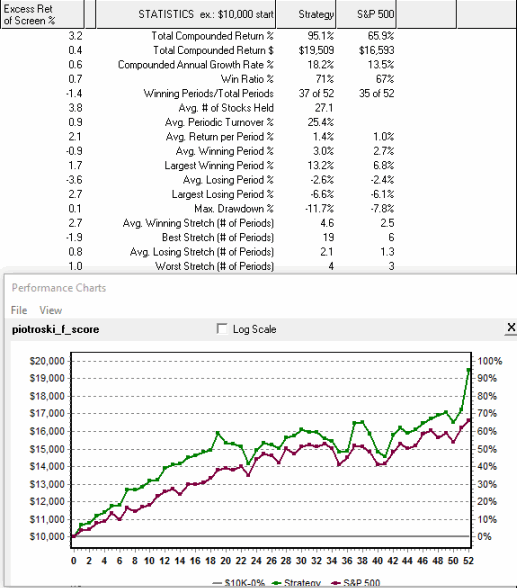 At least 5 fee-based screeners have versions of the Piotroski strategy as pre-built screens. You can check out the historical performance of the Stock Investor Pro screen here. If you are an AAII member, you will also be able to view the performance chart and criteria. You can use a free trial at Portfolio123, Stock Rover Premium, and Uncle Stock to examine the screen and criteria they offer. One way to evaluate a stock screening tool that includes back-testing is to run the back-test on a pre-built screen (see below with Research Wizard). The next step is to modify the screen and use back-testing to examine changes in performance. Check our example of Piotroski value investing using Uncle Stock. We ran a back-test of the pre-built strategy on Research Wizard with the following results. The April, 2010 issue of the AAII Journal has an excellent article by Cara Scatizzi on the Piotroski Score and the effect of the using TTM data rather than annual data to calculate the signals. This addresses freshness of the data issues. The lack of passing stocks from a rigorous use of a perfect score of 9 is also discussed. NOTE: The AAII article is not a rigorous study but does provide some insights on common questions about P/B investing.